Bionic bartenders, virtual reality on flights and suitcases that link up to your smartphone offer a glimpse of the future of travel.The Anthem Of The Seas is the world’s third-largest cruise ship, and it calls itself the world’s most technologically advanced. 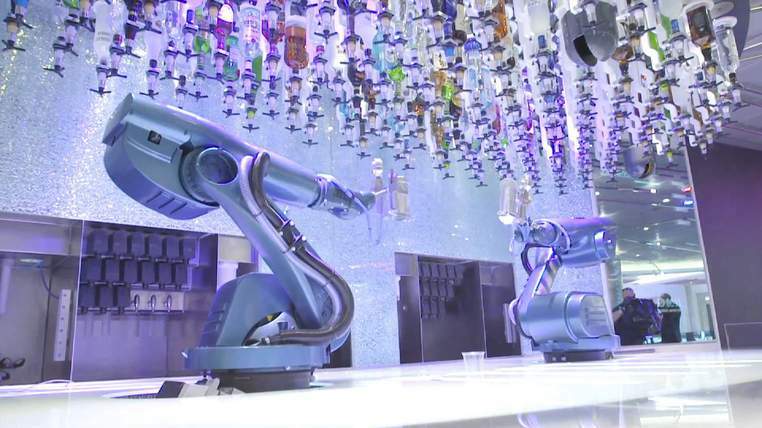 The new vessel, which sailed into Southampton this week, boasts an array of on-board tech – including a bar powered by two robot bartenders. Bio and Nic are equipped with a series of sensors that detect when a guest enters the bar. They can then serve customers the drink of their choosing, selected through a touch-screen panel. Also on board is an entertainment area that features six 7ft screens, controlled by robot arms. They can be configured to display separate videos on each, or unite to form one large scene. Alison Frazier, director of entertainment and guest activities on board the ship, says the idea behind all this tech is to add variety to the traveller’s experience. “You can go to the traditional pub and get a pint, or you can go to the bionic bar and have one of the robots create a special cocktail. You can see a traditional comedian or you can go and be wowed by the show on the robo-screens. It’s really something for everybody,” she says. It’s not just cruise ships that are finding innovative ways to try to make your holiday better. Bluesmart is a connected suitcase that claims it will make travelling less stressful. It links up to your smartphone and can be tracked so you always know where it is. It also has a digital lock, a built-in battery charger and its own scale so you can tell if you’ve packed too much. Airlines are also looking at ways of using technology to make the journey a more enjoyable experience. Qantas and Samsung are working on a trial to give passengers access to virtual reality headsets in airport lounges and on some flights. It will let flyers see the destination they are travelling to, or watch movie content in a 3D environment rather than on the back of someone else’s seat. But some say that all this technology is nothing more than a gimmick. In fact, he believes that technology in travel lags behind other industries. “The more I see of 21st century travel, the more it seems completely unjoined up. Sure, I can buy a train ticket online, but most of the time it’s going to be a little bit of cardboard with some writing on it, which is a bit of a 19th century idea,” he says. While machine-made mojitos may not be for everyone, one thing does seem certain – as the market for travel tech grows, it’s likely we’ll see more innovations like these.